Birds are marvelous creatures. Over millions of years, their forelimbs evolved into wings, allowing them to fly places. Some of them such as the Common Swift spend ten months of a year in flight. They eat, sleep, and even mate while in the air. On the other hand, some migratory and predatory birds can fly at altitudes of 30,000 to 40,000 feet. Here we take a look at the top 10 highest flying birds in the world. The ranking below is based on the highest recorded flights of various birds around the world. Migratory birds achieve incredible heights as they migrate for food and breeding. The White Stork aka Ciconia ciconia is a migratory bird that can reach a height of up to 16,000 feet. The bird has a distinctive long neck measuring up to 40 inches. The wading bird lives mostly in Europe and West-central Asia but migrates to southern Africa in the winter months. These birds migrate in flocks. The White Stocks have a wingspan of up to 2.3 meters, which helps them soar on warm air currents without continuously flapping their wings. The Bar-tailed godwit or Limosa lapponica is a migratory bird that spends the breeding season in Siberia and Alaska. They spend the winter months in the tropical habitat of Australia, New Zealand, Europe, and Asia. The Bar-tailed godwits hold the title of the longest continuous migration – covering 7,000 miles in just seven days. These birds feed on worms, aquatic insects, and mollusks. This migratory wild duck is found mostly in North America and Europe but migrates to Asian countries such as India during winter. They can reach a height of up to 21,000 feet, though they usually fly at around 1,000-4,000 feet. The Mallard ducks (Anas platyrhynchos) have a lifespan of up to 10 years, though some of them manage to live up to 20 years. Found in the Andes mountains of South America, the Andean condor (Vultur gryphus) is a large flying bird weighing up to 15kg in weight. The Andean condor is a scavenger that feeds on dead animals. These birds have a maximum wingspan of up to 10 feet and 6 inches. They can reach a height of up to 21,300 feet. The Andean condor is an endangered species due to habitat loss and excessive hunting. It is the national bird of many South American nations including Chile, Ecuador, and Bolivia. The bearded vultures (Gypaetus barbatus) inhabit the mountainous regions of Southern Europe, Asia, and Africa. Thanks to a wingspan of up to 2.8 meters, these birds can fly steadily at altitudes of up to 24,000 feet. They fly to their peak heights to take large bones up in the air and drop them in rocky areas until they break into smaller pieces. The bird’s digestive system is capable of digesting small pieces of bones in 24 hours. The Alpine chough (Pyrrhocorax graculus) has adapted to low oxygen levels at high altitudes. They are not only one of the highest flying birds but also the highest nesting birds in the world. These birds nest at altitudes higher than 21,000 feet. They have been recorded flying at heights of up to 26,500 feet when soaring through the Mount Everest. They feed mostly on fruits and short grazed grassland. The whooper swan is a migratory bird found in the wetland areas of Europe and Asia. They nest near lakes, ponds, and wetlands. The birds get their name because of the “whooping” calls. They usually fly in a ‘V’ shaped flock formation at heights of around 8,000 feet during migration. But they can reach a maximum height of 27,000 feet. The bar-headed goose (Anser indicus) is a migratory bird that lives in high altitude lakes in Central Asia. These birds can reach a maximum height of up to 29,000 feet. They can fly over the Himalayan peaks in low air pressure. They migrate to the South during winter. These birds can cover a distance of up to 1,000 miles in a single day while migrating. The common crane (Grus grus) lives in the Northern Europe and Asia during summer and migrates to Northern Africa during winter. These birds fly in ‘V’ shaped formations, even over the Himalayas. They fly at heights of about 33,000 during migration. 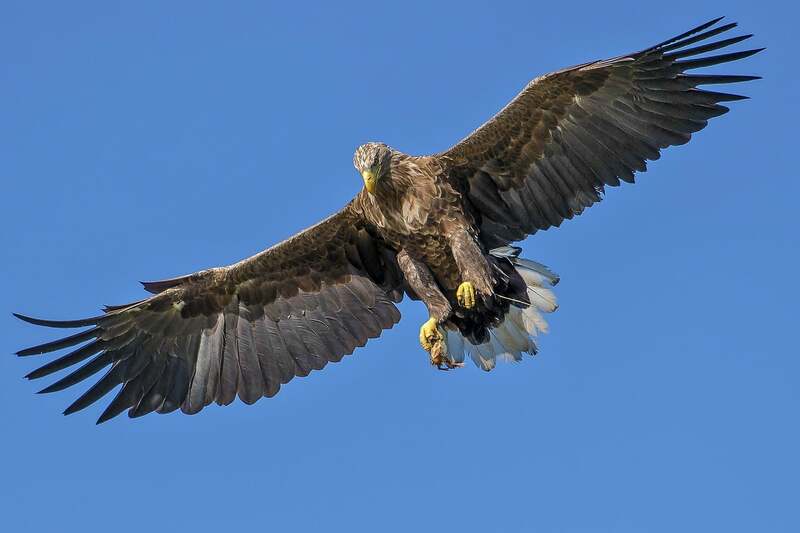 The extreme height allows them to escape eagles in mountain passes. Ruppell’s Griffon vultures are found in Central Africa. Their body has adapted to high altitudes where oxygen levels are low. Their blood contains a special hemoglobin that absorbs oxygen more effectively. These vultures fly at great heights not to travel large distances but to get a broader field of vision. They have a sharp eyesight and can spot prey from heights of up to 37,100 feet. They have a length of up to 1 meter and wingspan of 2.5 meters.